“God spared you for a reason.” To run like the wind. “Can you work?” Love how Jesse throws it back at him with his #CottonPicking story. Metals not records. Important distinction. Three #WorldRecords in 45 minutes. Unbelievable. Close vote, but no boycott. Out on the track there’s “no black and white, there’s only fast and slow.” You tell him. “Stop thinking so much, Jesse. It’s not what you’re good at.” Ha! Luz helping Jesse out on the long jump is a nice moment. The German crowd chanting “Owens” is a higher honor than the three gold medals. “Don’t lose.” Don’t worry, he won’t. The guest of honor has to go through the service entrance. Sad. Final analysis: a comprehensive look at Owens’ plight as a black athlete during the 30s and his rise to fame. Rating: 2 1/2 out of 4. Despite being overlong and slowly paced #Race is an inspirational biopic with an important message. 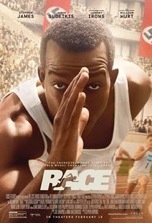 There’s a double meaning implied in the title of this latest Jesse Owens biopic, Race. The obvious reference is to the movie’s focus on Owens’ career as a track legend, culminating with his astounding performance (four gold medals) at the 1936 Summer Olympics in Berlin, Germany. The other meaning inferred by the title is Owens’ race—African American. The bitter irony here is that despite his tremendous athletic talent, Owens was treated with contempt both by Caucasian members of his own team and especially by citizens of the host nation, whose white supremacist ideals sought the eradication of Jews and blacks (ironically, two Jews were bumped from the 4 x 100 meter relay so that Owens could participate, so apparently blacks were a bit better than Jews in the twisted minds of the Aryan adherents). There was no safe haven for Owens on American or German soil, which makes his courageous story even more remarkable. Ultimately, this movie isn’t about black and white or fast and slow (as Owens avers in the film), but heroes and villains. Aside from Owens himself (Stephan James), Owens’ coach, Larry Snyder (Jason Sudeikis), is a driving force for good (and progress) in the film. Other heroes come from unexpected quarters, such as the appropriately named German long jumper Carl “Luz” Long (David Kross), who helps orient Owens to the course and German film director Leni Riefenstahl (Carice van Houten), who dared to defy Hitler by filming the 200 meter dash for posterity, an event Owens was predicted to win. The movie’s villains are the racist white Americans (like the brutish Ohio State University football players who force Owens to take a shower after them) and the many nationalized and propagandized Germans. Of course the Kaiser himself is the greatest villain here—besides initially banning Jews and Blacks from the Games, which nearly sparked an international boycott, Hitler refused to shake Owens’ hand in clear defiance of Olympic tradition for gold medal winners. Granted, there are a few gray characters in the film as well, such as the duplicitous Avery Brundage (Jeremy Irons) and prejudiced Olympic team coaches like Lawson Robertson (Defiance’s Tony Curran). Race has greater scope than earlier films based on Owens’ life and has the added benefit of CGI as a storytelling tool. These computer effects are most noticeable in the sweeping crowd scenes when Owens first enters the Olympic stadium in Berlin. But is the movie better off for all of its technological advances and advantages? Opinions will vary, but I think CGI was judiciously employed in the film. The effectiveness of the movie’s broad stroke approach to telling Owens’ story is also a matter of debate. Some will appreciate the movie’s in-depth history lesson and the many ancillary story lines (Riefenstahl) that are woven into the movie’s narrative tapestry. Others (like moi) will maintain that the film takes us away from the focal point (Owens) too frequently and tries to achieve too much in the social and political arenas instead of adhering to its core identity as a historical sports movie…unlike the exploits of its main character, the story isn’t very streamlined. How ironic that a movie about sprinting should be paced like a long distance run and have the running time of an average half marathon. Race is an educational and inspirational film that ultimately fails to move its audience. Sad to say, but despite its efforts to decry the injustices of prejudging a person based on their appearance, Race is skin-deep.